Overall: We would like to say that this is at this point the most superior hoverboard available and its fast speed makes it one of the fastest hoverboards we’ve tested. We recommend this to the adrenaline junkies and speed freaks any day of the week! Speed, A fast hoverboard like this isn’t something you get to test every day. Distance, It has over-delivered on every single thing including the distance. Height, Its extra height will make you move over obstacles with ease. Shipping, Really fast and safe shipping options. Warranty, A 1 full year warranty which will cover most damages except those you create. Climbing, Can go up 30 Degrees of incline. Extra-long warranty, You cannot add extra-long warranty or extend it to cover user damages. All though you’re insurance might cover the costs. Lip, Even though I understand the use of the lip is to not touch the wheels with the foot it would be better to lower the standing platform and use a lip that doesn’t go over the wheels. This way there would be zero possibility to damage the device while dismounting/falling during riding. Scratch rubber, We suggest that you buy some extra self-adhesive rubber to attach to the lip mentioned above. So we just received a new hoverboard with bluetooth which is of outstanding quality! It’s the FutureSaw from StreetSaw. Their punchline is: Hoverboards with attitude and we must say we have to agree with them on that one. The design is so cool. Slick and just perfect. Simple but with everything you need the FutureSaw is by far one of the greatest self-balancing scooters on the market right now! Their delivery time and warranty of 1 year doesn’t really speak against them either. We got our device in about 4 working days which is very fast. First glance and we fell in love with it. Not only does it have an incredible speed of 13 mph (We actually clocked it at 14 mph) it comes with a secure battery from Samsung and they assure that these batteries are legit Samsung high quality Grade A batteries. The warranty will also vouch for the quality of these products. All their products use the same motor technology as the tesla cars which speaks of high quality motors and what a ride it was. We took it for a spin and we reached over 15 miles with this self-balancing scooter even though the specification only said 12.5 miles. It has a fast recharge time of 2-3 hours and you can even upgrade the battery if you feel the need too. The design will give you a 10 cm space underneath so that you can easily ride over various obstacles, a great future and this is compared to the 3 cm the regular hoverboards have. You can buy a remote control with your purchase so that you can turn it on and off without having to bend down to push the button. You might think this is just lazy but after a while of short rides you will see why this comes in handy. This is also a high quality hoverboard with speakers and Bluetooth so you can ride around listening to your favorite music. The speakers are far more superior to many other brands and which comes with crappy low quality speakers. 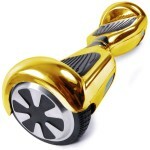 The Bluetooth has an 18 foot range so you can easily dismount and move around a bit without losing connection. Its still available and it led the Jetson hoverboard out of the way even though they were similar in functions and both had the bluetooth function. This is one of the fastest hoverboards you can get your hands on at the moment and if you like to see how it did in our fastest hoverboard test check it out here! The best things are, that it’s a US based brand with fast & secure delivery and this extensive warranty of theirs is top of the line. Not to speak of the quality and features of the FutureSaw! If you’re looking for a great valuable and fast hoverboard then the FutureSaw hoverboard with bluetooth should be your go to device! Halo Rover Review – Personalized off-road hoverboard, worth it?